Norwex is in the news again! The video is shaky and about made me nauseous, but it is still exciting to see Norwex in the news! Although Norwex does not endorse this video interview, we do concur with her findings. Norwex was featured by Fox News channel 2 in St. Louis, MO. See at 2:25. See the news video here: http://fox2now.com/2015/05/20/beauty-products-for-allergy-season Featured Sonja Shin, an award-winning journalist, provided a Norwex product promotion and has a blog at hellobeautyblog.com. 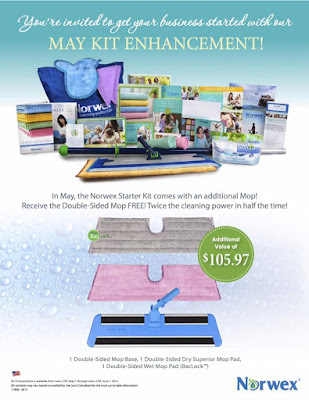 In May, the Norwex Starter Kit comes with an additional Mop! Receive the Double-Sided Mop FREE! Twice the cleaning power in half the time! Kit Enhancement includes 1 Double-Sided Mop Base, 1 Double-Sided Dry Superior Mop Pad, 1 Double-Sided Wet Mop Pad (BacLock™) and is available from noon, CDT, May 1 through noon, CDT, June 1, 2015. To qualify for May Specials: Sales must be received at Home Office after 12:00 pm CDT (noon) on May 1 and before 12:00 pm CDT (noon) on June 1.